With 4 days left on it’s Kickstarter and $24,000 left to go, I feel it’s my duty to shed some light on this game for you guys, as it seems not many people are highlighting this upcoming hybrid point n click adventure shmup currently in development. As a primer, Starr Mazer originally started as a conceptual video during a compilation film project made by the studio Imagos Films over 3 years ago, but due to recent attention from the gaming communities demanding the concept to be put into production to be a real game, Don Thacker, the original director of the conceptual video, now director of the game itself, along with his crew at Imagos Softworks, finally decided to make it a reality, and put the project on Kickstarter in order to fund it. But I feel you guys aren’t convinced, so here are my 5 reasons you might want to support the game. 5. An Awesome Soundtrack: The one thing I was immediately struck by when I watched the conceptual video was the music in it. The title track, composed by Alex Mauer, the game’s composer/sound designer, he definitely set the mood with the MSX2 inspired song and so far, as the game is coming along, and with the amount of talented musicians now attached to the project, such as Manami Matsumae, composer of UN Squadron, Megman, also contributing to the awesome Shovel Knight and it’s soundtrack as well as the upcoming Mighty No. 9, It’s needless to say that I believe the soundtrack will rock your socks. 4. Awesome Art Design: while I am a firm believer that graphics don’t make a great game, I am also a believer that a good art design, can really make a game stand out, and so far Starr Mazer delivers in spades. From the super detailed Sprites from the opening cutscenes and shmup portions, to the cartoonishly defined and well animated sprites from the actual gameplay, the game oozes with great art design, and overall I can’t wait to see the whole game in motion for myself. 3. 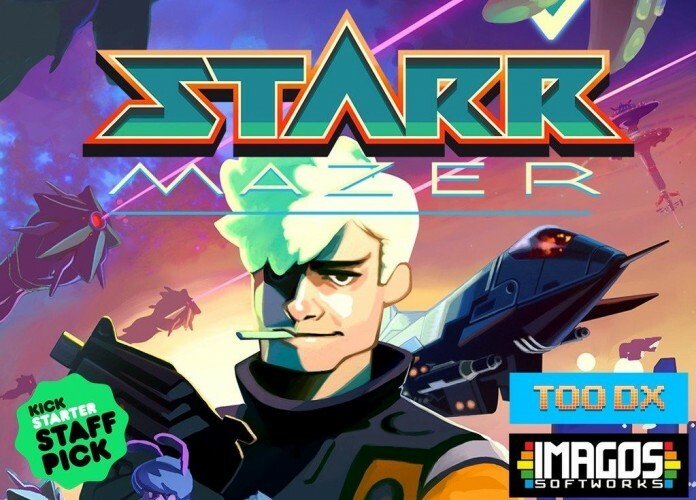 A talented/devoted team: I am a believer that how a development studio interacts with each other, and the passion they display, can really show in the product they work on, and Starr Mazer is a good example of that. After the months I’ve spent following the project, it seems that everyone on the team is not only super devoted to making this game happen…they also display the passion and love for what they do. Looking through their dev blog, also makes that very apparent. This team really wants to make this game happen, and for that I feel this is a very important thing to bring up as Starr Mazer is a good reflection of these qualities. 2. An awesome Concept: The original reason I got hooked on this game’s development to begin with, was the idea of mixing both a point n click adventure, with aspects of a Side-scrolling shoot em up. I mean how cool is that? A Lucas art’s style adventure game with funny humor, and an arcade game mixed in to boot? Yes Please! Also I’m not the only one who thinks the same thing, many others feel the same as well, and its for this reason overall I’m bumping it on the site. 1. An Awesome game: while it is still too early to tell, and I might eat my words when writing this, I do realize that it is possible the game may not live up to the expectation or hype. But I feel it’s important to give all projects the chance they deserve. I mean the same happened with Shovel Knight, another game which got funded through Kickstarter, and people had their apprehensions about that game as well, and yet the game became a major success. So this is why I feel this is the most important reason you might want to consider supporting the game. With the many talented passionate people on board this project, and the overall effort they are extending to make this game happen, I am confident the final product will reflect all the blood sweat and tears that these amazing people are putting into it right now…but that won’t happen if the game isn’t funded. So there we go! Those are my 5 reasons you might want to go support this game! If you feel convinced, and you want to help support the creation of an amazing game, then go to their Kickstarter and throw a couple of bucks their way, I feel you won’t regret it. If you still aren’t sure whether to support them or not, then feel free to head on over to their dev blog, and see what they are all about. Previous articleUncharted 4: A Thief’s End – Who is Sam?